Looking past the importance of the window in commercial projects can be a big mistake. Windows and window furnishings have the potential to transform the environmental load of any project and greatly improve the functionality and efficiency of a space. Commercial spaces have a massive role to play in the green movement. Research shows employees are less motivated to act environmentally responsibly in the workplace than at home because they don’t have a financial interest in doing so. In addition, equipment is often shared so there can be a lack of responsibility and elements such as heating or lighting is often out of their control. At work employees are also often heavier users of heating, lighting, air conditioning, ventilation and computers and generate more waste. Many corporations are taking responsibility for their environmental impact by putting into place initiatives to improve the sustainability of the business. This corporate responsibility should - but doesn’t always – stretch to the technology of the building in which the business operates. This extends to retail projects, where there is a combination of people using the space for work, and also for day-to-day tasks and leisure. By equipping themselves with knowledge on the latest technology, an architect can create a project that not only serves the immediate economic, aesthetic and environmental needs of a business, but those of generations to come. Windows are hugely important in the overall aesthetics, efficiency and security of a commercial project. The connection between maintaining a link to the outdoors and productivity is well documented, but it can lead to excessive space conditioning loads. Currently the window market is dominated by insulating glass units, which are typically two panes of glass held apart by separators and often a custom gas between the two panes, but this technology is just the tip of the iceberg. The window is much more than just a barrier to separate the inside from the outside. What if it could be used to improve efficiency, productivity and security? When cutting-edge research and the latest technology collides, things start to get interesting. Dr Robert Tenent, researcher for the National Renewable Energy Laboratory says most of the current window research can be broken down into a few key areas. Improving thermal performance is mainly pursued through triple pane designs. The third pane often takes the form of a lightweight film or thin glass layer in the middle of the insulating glass units. A supplier in the US has been able to produce a unit with multiple layers of plastic films to achieve an “R-10” window. The second approach is the ongoing development of vacuum insulating glass. “This concept is similar to the multipane designs, however the gas between the two panes is removed to create a vacuum which dramatically improves thermal performance,” explains Tenent. A key benefit is the system can be very thin, which makes it acceptable for retrofit of single pane units. Tenent also says that the technology is “finally starting to emerge from major suppliers” noting that many major commercial glass companies are actively researching the technology and evaluating partnership options, while multiple start-up companies are active in the area. The two main strands of smart window technology can be broken down into electrochromic and thermochromic technologies. Electrochromic units control their tint through application of a small voltage which provides flexibility for the user in how they control the unit. However, that flexibility comes with a high price point, which is currently limiting adoption. Thermochromic technologies tint based on temperature. “This more passive approach carries the benefit of not having to wire your windows in to the building system…however you do lose some of the flexibility,” Tenent says. Thermochromic technology is designed to switch at a certain temperature which is either set at the factory or built into the materials. Since it is more difficult to customise, it could limit the scalability of the technology. Research into smart windows is taking place at Griffith University, where Professor Huijun Zhao, director of Centre for Clean Environment and Energy is eading a $1 million project into a low-cost, energy-saving “smart window”. The initiative is working to develop a window that contains a glass that can change its colour and the amount of light or heat that it transmits. Zhao says windows played an important role in the energy efficiency and the new smart windows would provide significant energy savings by reducing reliance on air conditioning, heating and artificial lighting. “This is particularly important for office buildings, hotels, and schools where the energy consumption for heating, ventilation and air-conditioning (HVAC) and lighting are more than 70 percent of the total energy consumption,” he says. Solar windows could have a massive impact in commercial projects, where often the roof size provides a limited opportunity for traditional solar panels, compared with the overall floor space. “By developing a solar technology that can be effectively integrated into a glass unit, you greatly increase the potential for development of ‘zero net energy’ commercial buildings,” Tenent says. The difficulty with this technology is finding a balance between harvesting the solar energy and allowing the light through so people can see through the window. To get around this, some researchers are developing solar materials that absorb energy outside of the visible light spectrum – typically either ultraviolet or infrared radiation. Researchers at Michigan State University developed transparent solar cells which they argue that together with rooftop units could nearly meet electricity demand in the US. 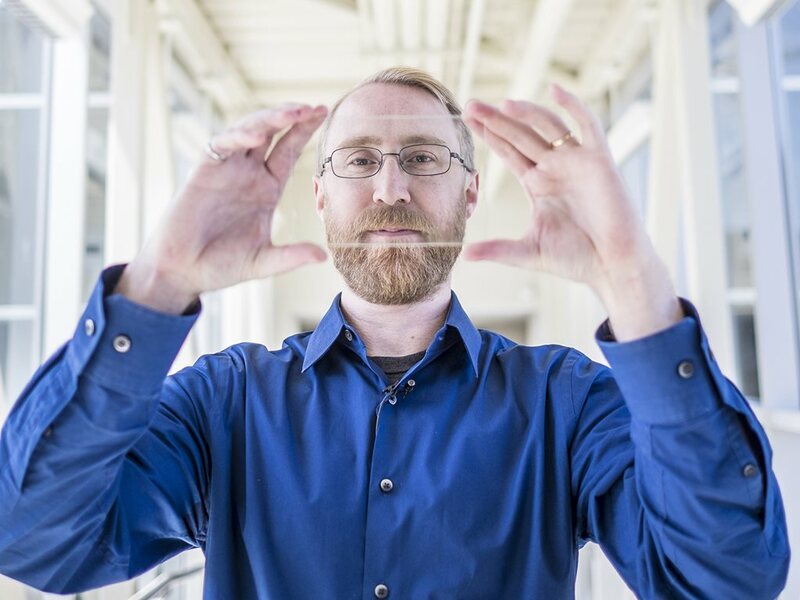 “By harvesting only invisible light, these devices can provide a similar electricity-generation potential as rooftop solar while providing additional functionality to enhance the efficiency of buildings, automobiles and mobile electronics,” says Richard Lunt, the Johansen Crosby Endowed Associate Professor of Chemical Engineering and Materials Science at MSU. The technology is recording efficiencies above five percent, while traditional solar panels are about 15-18 percent.